Coahuila (Agenzia Fides) – The Catholic Bishops in north east Mexico have united to welcome convoys of migrants attempting to enter the country and pass the border with the United States of America. Bishop Alonso Garza Treviño, of the diocese of Piedras Negras, Coahuila, says he intends to open a new Migrants Home in that area. Similar decisions have been taken by the Archbishop of Monterrey, Rogelio Cabrera López, the auxiliary bishop of Monterrey, Mons. Heriberto Cavazos Pérez, and the Bishop of Saltillo, Raúl Vera López, O.P. For some time these dioceses have assisted migrants since the issue has reached the international level. Bishop Alonso Garza Treviño, reports that Caritas Centres work swiftly but the activity of the civil authorities is slower. In Piedras Negras many migrants drowned attempting to cross Rio Bravo. Archbishop Rogelio Cabrera Lopez says the situation is now an international matter calling for the attention of everyone, Pope Francis contiinutes to call for more assistants for migrants. Bishop Heriberto Cavazos Pérez. Mentre Mons. Raúl Vera López reports on his arrival in the diocese of Saltillo worked with Fr Pedro Pantoja to open a Home for Migrants. "While the government in Washington says it has no power to stop asylum seekers it asks Mexico to detain them" said Lawyer Jaime Barrón, who works in Dallas, Texas to assist migrants. 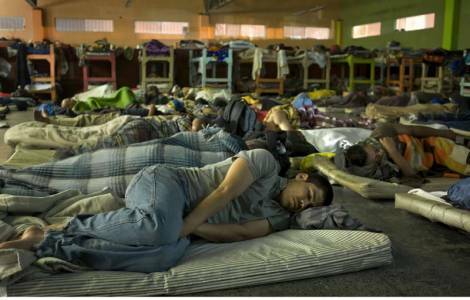 "In my opinion this situation is disputable to force people not to ask for asylum" he added. "People fear being held in Mexico for months, years and these are people without shelter or food " warns Barrón.